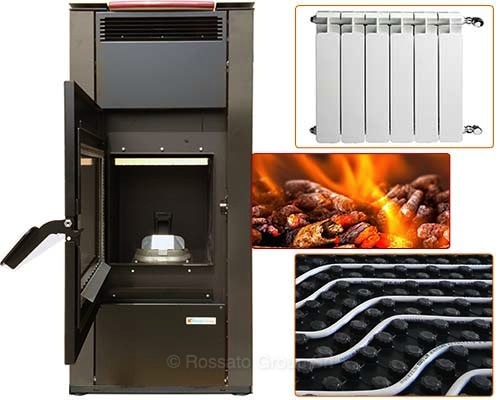 They are part of the biomass generators Rossato Group new stoves and wood boilers or pellet, perfectly compatible with other system components Rossato: can be installed in combination with solar heating systems, the heat pump Air Combo and the radiant systems. Circe is the stove, Ninfa is the pellet boiler and Tiberia is the wood boiler: three practical solutions for the replacement of old gas and diesel systems. They offer significant cost savings over time (up to 80%). 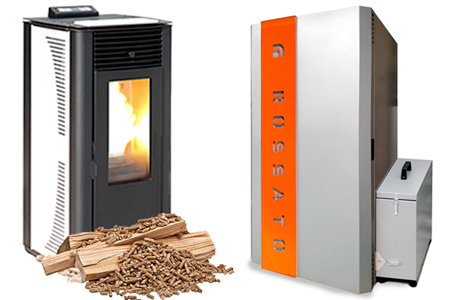 Systems Wood and pellet Rossato are an excellent solution for energy conservation and for environmental protection. The boilers and pellet stoves and wood allow you to make use of local or government incentives that make them even more affordable. The purchase of a biomass system is a great investment that can be very save over time and with depreciable costs of the product also in the space of a year. 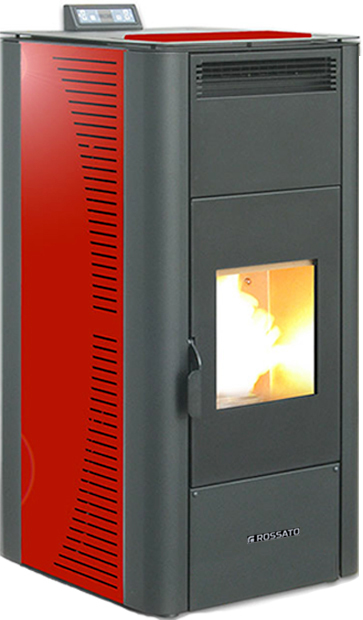 Hydro pellet stoves Circe innovative design are used primarily for heating, combining them to existing systems or radiant heaters. 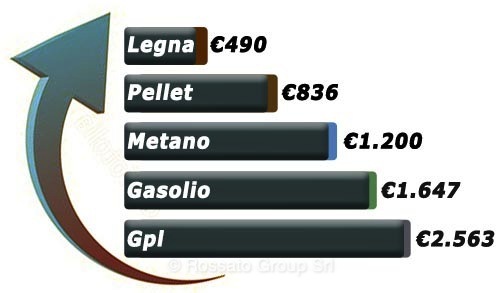 The Ninfa pellet boilers allow to heat, large environments with minimal consumption of pellets. Allow manual or automatic cleaning of the ducts. 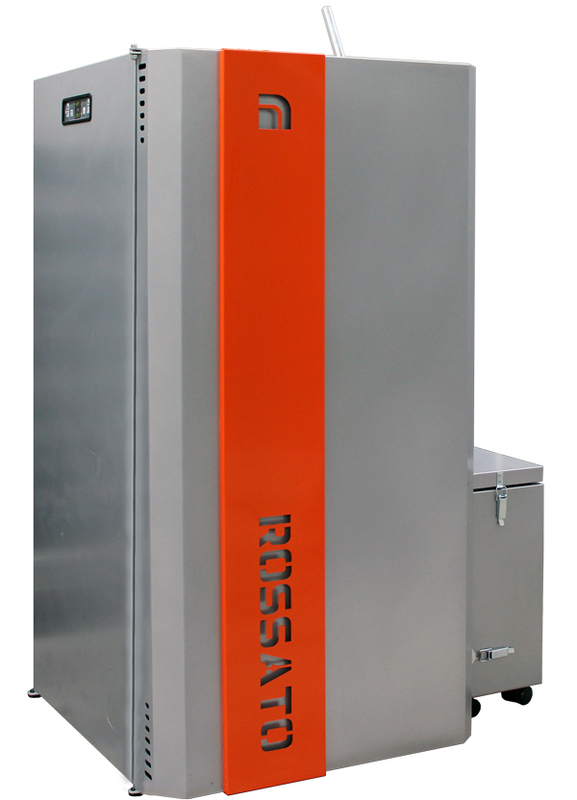 The wood-fired boilers Tiberia working with the principle of the inverted flame gasification for heating and domestic hot water. 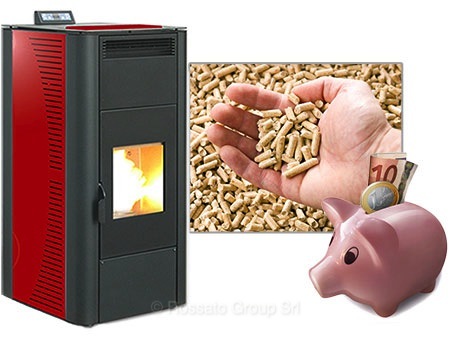 Biomass boilers and stoves ensure a saving in electricity bills, enjoy the thermal account and income tax deduction of 65%. The biomass generators are tested and tested both internally and by the certification body TUV for 5 class. The biomass generators require no gas connection and have no tank with dangerous substances. Circulation pump, expansion tank and safety valve are already on board for quick and easy installation. 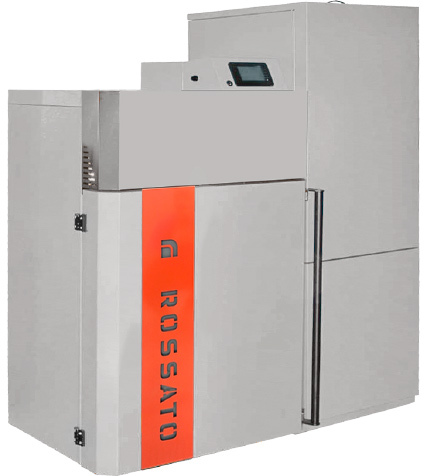 Rossato biomass generators are covered by warranty for a period of time equal to 7 years, throughout the boiler body. The graph represented in euro cost of fuel needed to heat an apartment m100 for 2 1 years (180 days / 8 hours a day). "Source: Consumer Centre - March 2015"
The wood-fired boilers are the solution for energy conservation and for environmental protection. Allow you to benefit from incentives or local government that make it even more affordable. The wood boiler can save up to 80% compared to traditional systems of heating. The biomass generators are intended for the production of domestic hot water through the automatic combustion of the pellet or the wood. The operation process is handled by an onboard computer programmed to obtain high yields avoiding waste. The hot water is used to feed the radiators, radiating panels, and then heat the rooms. With the use of additional components it is also possible to produce hot water for domestic use, that can be accumulated in special kettles to be always available at the desired temperature. 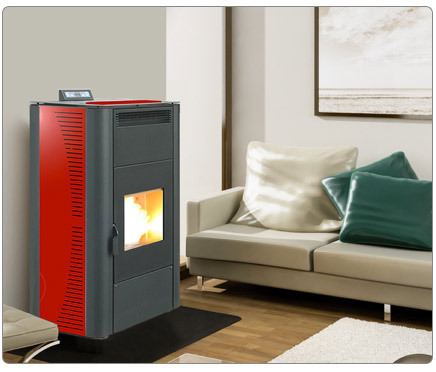 The stoves and pellet boilers allow you to heat up even large surfaces, for a lot less than the traditional boiler thanks to the low cost of the pellets. They can be used in any type of plant, such as replacing the traditional boilers or in new construction installations. They are suitable for heating systems with radiators: unable to heat the radiators in a few minutes allowing significant energy and cost savings. Also the combination with heating systems with radiant panels is very simple and allows for comfort and savings in winter. The integration of a boiler or heater and a solar thermal system is an excellent plant solution, both for the production of sanitary hot water and as heating integration. 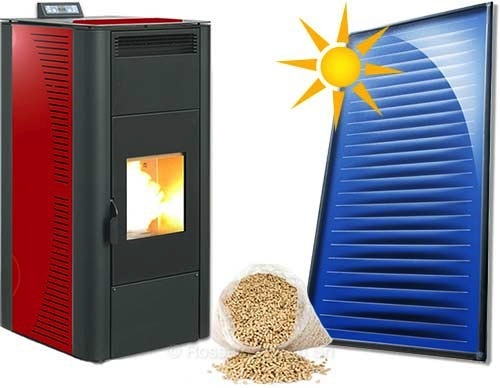 On sunny days in winter, the sun gives heat input to the boiler and reduces the operation, allowing a longer autonomy of the pellets. During the summer, the hot water can be produced entirely by the solar system, thus preventing the ignition of the pellet boiler. E 'can use a single storage tank is connected to the solar boiler. 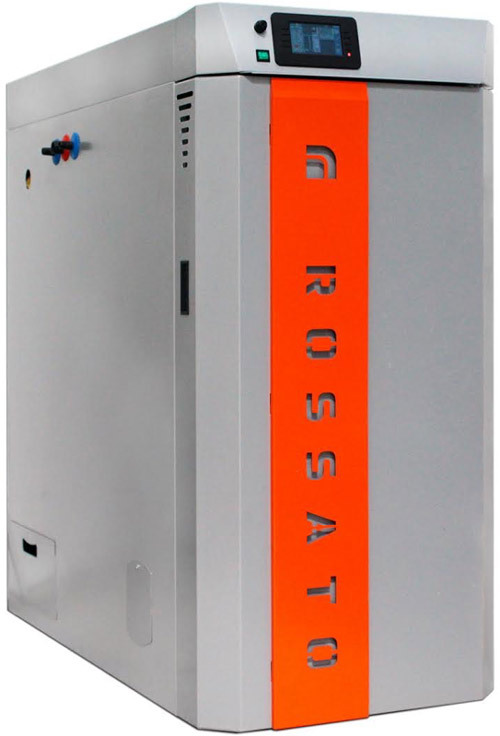 The combination of biomass systems with the water heater in the Air Combo heat pump is a simple and smart solution. In winter the pellet stove can heat the 'domestic water contained in' Air Combo. 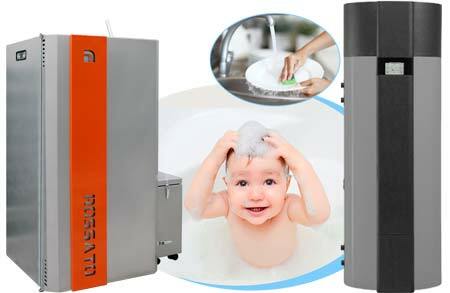 In summer and in spring and autumn, the hot water can be produced by Air Combo, without turning on the pellet stove.